Follow the instructions. While this may seem unnecessary to some, just listen to me. No matter what other people say, you need to follow the instructions to turn off the power to the furnace before you install this thing. Because maybe other people live in apartments and if they screw it up the landlord will fix it. Or maybe other people don’t live in nearly 100-year-old homes and therefore don’t have strange and mysterious wiring. Just do yourself a favour and do what the instructions say. Because if you don’t and you blow a fuse *in your furnace*, the resulting service call will cost you almost the price of the Nest itself. The mobile app is convenient. It is awesome to be able to change the temperature in the house when you aren’t in it. If you go away for a day and forget, or just want to turn the system off because the weather is different than you expected, you can. 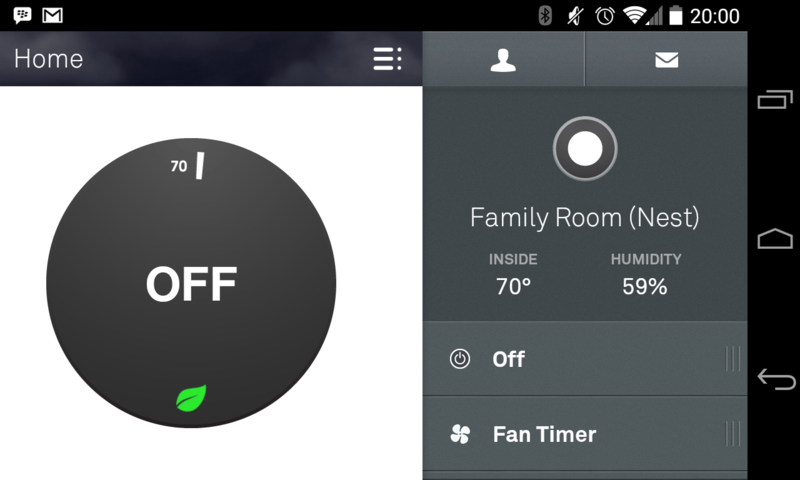 If you are in a part of the house that is far away from the thermostat and is warmer than you want, you can use the app to turn on the fan and push the cold air through the house. Monthly usage email. Apparently I’m a competitive person, because I love how the monthly usage email compares you to the rest of your nest peers. For example, this month my thermostat earned 31 leafs. That means my cooling system was operating at an environmentally optimal temperature 31 times. That corresponds to roughly 41 hours of usage for the month. In the same time, the average number of leaves earned by other nest thermostats was 17. Yay me! It is packed with lots of stats and fun facts. Away detection saves a lot of energy. Once you get over the fact that Google essentially knows when you are home and away (which for me, as an Android phone user, they know already), the home/away detection is actually really cool. A programmable thermostat is one thing, but if you’ve got the AC set to come on during the day on the weekend and then you spend most of the day out, the away detection automatically changes the thermostat to run on your away profile. So far so good, aside from the initial setup hiccup. I’m really interested in adding some Nest Protect smoke alarms to the house. I’m a big worrier when I’m away, so the idea of being able to check in with the mobile app appeals to me. Liked it? Take a second to support Alyssa Clarkson on Patreon! Have you found that you’re actually saving much money on the utilities? About 10%. It’s more about managing consumption and having an efficient regulation of temperature. Thanks for the reply. My thermostat is due for a replacement and I’m debating a Honeywell WiFi unit vs the design / ui premium of a nest. Does the Nest only rely on it’s built-in motion sensor to determine if you’re at home or away? I’ve been interested in them for a while, but I just don’t know how effective it would be in our house for “learning” our patterns. Our thermostat is placed in a really awkward place, next to the stairs in a corner of the main floor that nobody ever walks “past”. The only motion it would see would MAYBE be someone going up or down the stairs. If you install the app onto your smartphone, it will use your phones GPS. You can disable the motion sensor, IIRC. Also, it’s IFTTT compatible. A Nest can be programmed to Away when your iPhone leaves the house!